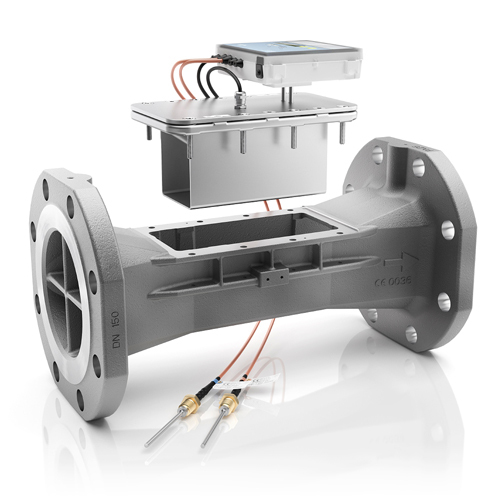 The special feature is the exchangeable measurement insert, which significantly simplifies maintenance and recalibration and reduces life-cycle costs simultaneously. The flanged body remains permanently in the system – without any influence on the measuring accuracy and stability. This distinguishes the new ULTRAHEAT from similar measuring devices. The calibrated measuring unit consists of the measuring channel, the sealing plate with the proven ultrasonic transducers and the adjusted electronic of the T550 (UH50…). The flanged body itself has no influence on the measuring accuracy or stability and remains permanently in the system. For recalibration only the lightweight measurement insert needs to be exchanged. This can easily be done by one person and without any special tooling, reducing life-cycle-costs tremendously. The functionality of the electronic unit is identical with those of the T550 (UH50…).